Gastrointestinal bleeding due to angiodysplastic lesions of the large bowel is a common problem among patients receiving hemodialysis and may sometimes be life-threatening. Several hypotheses have been advanced in order to explain the increased incidence of these lesions in this cohort of patients, including degenerative, metabolic, circulatory and other systemic factors. In terms of diagnosis, several advances have been made with sophisticated techniques, but endoscopy seems to be the most effective, having a dual role in diagnosis and treatment. Although most bleeds stop spontaneously, conservative treatment may not be enough. Endoscopic treatment, embolization with infusion of vasopressin, surgical resection of the bleeding intestinal segment and hormone administration may be useful therapeutic tools. Public awareness of organ donation fundamentally affects the organ transplantation programs. This study was performed to assess the attitude and willingness of high school adolescents regarding organ donation. The study population consisted of 416 high school girls who were studying in four grades of three educational courses. Data were collected by a questionnaire and included demographic variables and attitude and willingness, which were assessed based on the Likert scale. The SPSS v.16 was used for data analysis. The mean age of the study subjects was 16.26 ± 1.06 years, 31% studied in grade-1, 27% in grade-2 (25% natural sciences, 27% mathematics and 48% humanities), 26% in grade-3 (30% natural sciences, 34% mathematics and 36% humanities) and 16% in pre-university stage (32% natural sciences, 42% mathematics and 26% humanities). The students had a highly positive attitude toward organ donation (mean score 4.2 ± 0.54). The greatest willingness for organ donation was concerning the kidney (88%) and heart (84%), followed by the liver (83.4%), pancreas (79.6%), cornea (67.8%) and skin (51%). Willingness for deceased as well as living organ donation was indicated by 92% and 47%, respectively, of the participants. 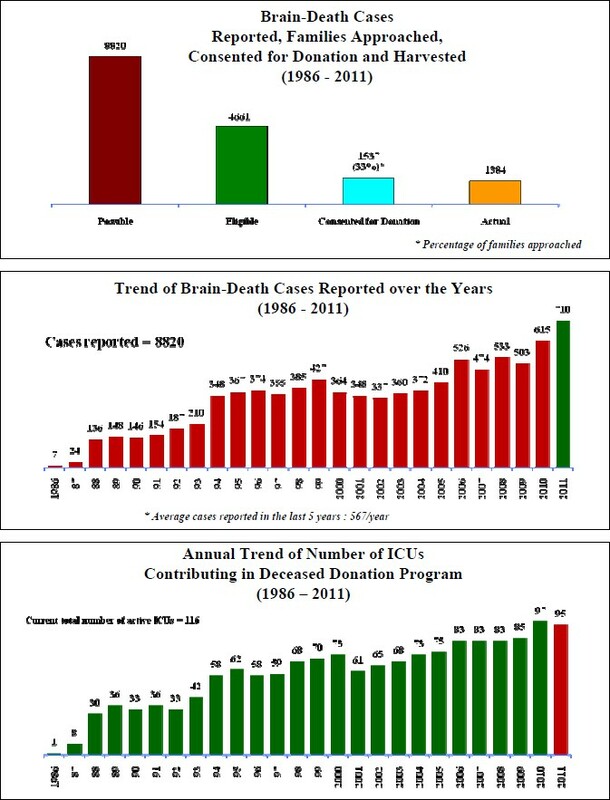 Organ donation was considered acceptable only to relatives by 5% of the participants when the donors were deceased donors and by 16% of the participants when the donors were living donors; donation to all needy persons from deceased donors was accepted by 87% of the participants and from living donors by 31%. The purpose of donation was stated as lending help to others by 89% and progression of science by 40.2% of the participants. Willingness for organ donation from a deceased relative was declared by 63% of the students. There was significant positive correlation between willingness for organ donation and attitude (P <0.001). In addition, attitude and willingness had positive correlation with educational levels, age and educational courses. Our study suggests that Iranian adolescents have a great attitude and willingness toward organ donation, which reflects favorable knowledge of transplantation. Further research on public awareness in both genders and various age ranges is needed. Hyperphosphatemia is a significant risk factor for the development of ectopic calcification and coronary artery diseases in patients on hemodialysis (HD), and must be controlled with the use of phosphate binders. Studies comparing the effects of sevelamer and nicotinic acid, both similar non-calcium and non-aluminum phosphate binders, are not available. In this study, 40 patients on HD with a serum phosphorus level of more than 6 mg/dL were enrolled. After a two week washout period without phosphate binders, the patients were randomly divided into two equal groups (n = 20) and were started on nicotinic acid or sevelamer for a period of four weeks. The dose of nicotinic acid used was 500 mg and that of sevelamer was 1600 mg daily. Blood samples were drawn for the measurement of the total calcium (Ca), phosphorus (P), alkaline phosphatase (ALP), triglyceride (TG), total cholesterol (Chol), high-density lipoprotein (HDL), low-density lipoprotein (LDL), uric acid and parathyroid hormone (PTH). Patients receiving sevelamer showed a significant reduction in serum P level (2.2 ± 0.69 mg/dL; P <0.0001) in comparison with the nicotinic acid group (1.7 ± 1.06 mg/dL; P = 0.004). Reduction in the Ca-P product was significantly different in the two groups; in the sevelamer group, it was 21 ± 7; (P <0.0001) while in the nicotinic acid group, it was 16 ± 11 (P = 0.007). Also, patients on sevelamer showed greater reduction in the mean TG level (38.9 ± 92 mg/dL; P = 0.005). No significant changes were observed in the mean serum Ca, total Chol, HDL, LDL, ALP and iPTH levels in the two study groups. Our short-term study suggests that although nicotinic acid reduced hyperphosphatemia, sevelamer showed higher efficacy in controlling hyperphosphatemia as well as the Ca-P product. Cardiac troponin T (cTnT) and I (cTnI) levels are considered as important diagnostic tools in acute coronary events. They could be of predictive value in hemodialysis (HD) patients. The aim of this study was to determine the prevalence of increased cTnI and cTnT in HD patients and their prognostic relevance to all-cause mortality. We measured cTnT and cTnI at baseline in 145 asymptomatic HD patients. We used three different cut-off criteria to define elevated cardiac troponin levels as follows: the 99 th percentile of a reference population, the lowest concentration to give a 10% imprecision [10% coefficient of variation (10% CV)] and the relative operating characteristic (ROC) curve-determined value optimized for diagnostic sensitivity and specificity for detection of myocardial injury (MI). These concentrations were 0.01 ng/mL, 0.03 ng/mL and 0.1 ng/mL for cTnT and 0.2 ng/mL, 0.6 ng/mL and 1 ng/mL for cTnI, respectively. Patients were followed for all-cause mortality (median follow-up 551 days). 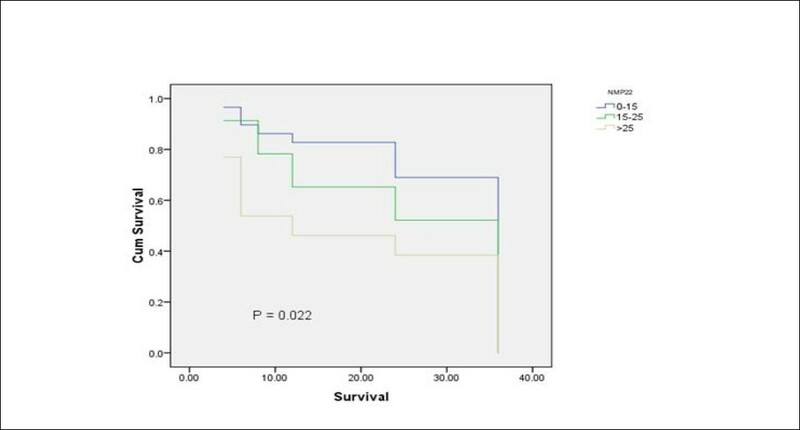 Kaplan-Meier survival curves, log-rank test and Cox models were employed to determine whether baseline cTnT and cTnI levels were predictive of mortality. Greater percentages of patients had an increased cTnT versus cTnI at each cut-off as follows: 99 th percentile, 90.3% versus 35.2%; 10% CV, 73.1% versus 2.1%; and ROC, 20.7% versus 0.7%. During follow-up, 40 patients died. 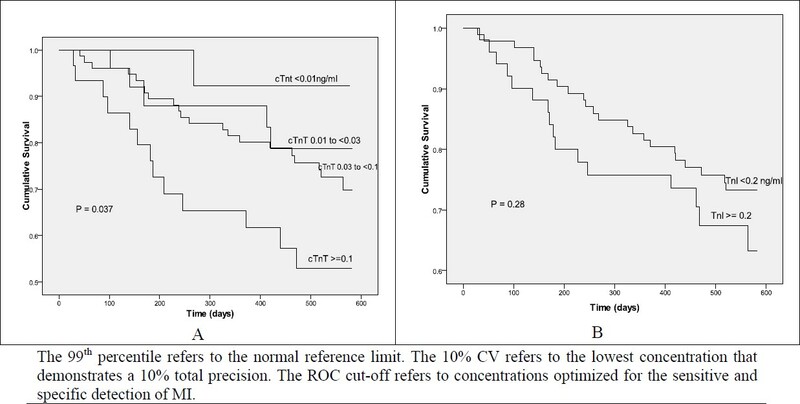 Elevated cTnT levels above the ROC concentration were associated with increased mortality, although it was not significant after adjustment for other risk factors. Univariate and adjusted hazard ratios were 2.3 [confidence intervals (CI), 1.2-4.5; P = 0. 01] and 1.9 (CI, 0.9-3.9; P = 0.07). No differences were found for cTnI levels. Diabetes mellitus was also an independent predictor of mortality. There is a high prevalence of positive cTnT and cTnI in asymptomatic HD patients, with a greater number of patients having an increased cTnT. Elevated troponin T, but not cTnI, seems to be associated with poor prognosis. Depression is recognized as the most common psychiatric problem in patients with end-stage renal disease. Stress negatively affects the quality of life of not only the patients on hemodialysis but also their caregivers. The objective of this study was to measure and compare the frequency of depression in these patients and their attendants, and to assess the associated risk factors in both groups. A cross-sectional study was conducted at our hemodialysis unit from June to September 2009. A total of 180 patients and 180 caregivers were enrolled and the Beck's Depression Inventory (BDI-II) questionnaire was administered. 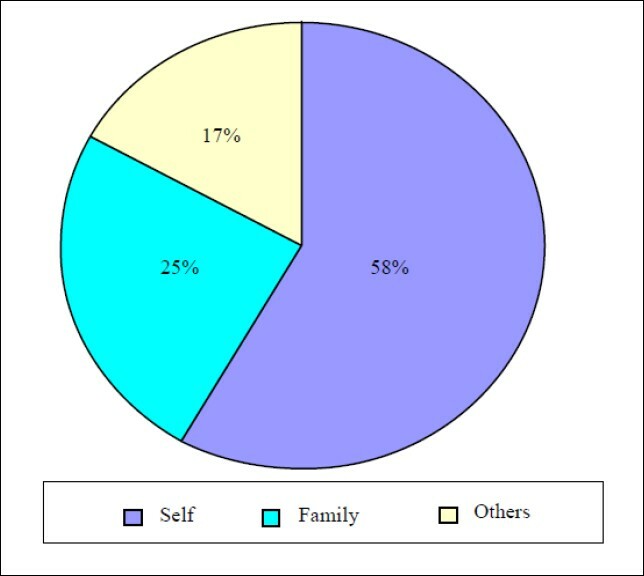 Of the 360 respondents, 201 (55.8%) were males and 264 (73.3) were married. According to the BDI scoring, 135 (75%) of the patients and 60 (33.4%) of the attendants were found to be moderately to severely depressed. Marriage (OR 1.817), low income status (OR 1.757) and unemployment (OR 4.176) correlated with increased depression grade, while gender and education level did not. Anemia was the only co-morbidity showing positive association with depression scores in the patients' group (P = 0.023). We conclude that the majority of the patients undergoing dialysis were depressed and were twice more likely to be depressed than their caregivers. In both groups, marriage and unemployment were associated with increased depressive symptoms, while household income showed negative association with depression. Gender and education level were not related to the depression scores. Chronic renal failure is an irreversible progressive condition responsible for high morbidity and mortality. Because it requires life-long treatment in the form of renal replacement therapy, the quality of life (QOL) of patients may significantly impair. Studies have revealed that patient education can play a significant role in improving the QOL in these patients. The primary objective of this study was to assess the QOL of patients on hemodialysis by using the World Health Organization Quality of Life assessment scale and also to study the impact of patient counseling in these patients. Fifty patients were selected for the study and they were randomly divided into two groups, control and test; counseling was given to the test group of patients. There was an increase in score in all the four domains (physical, psychological, environmental and social) among the test group when compared with the control group. Also, we found that the psychological domain showed significant increase in score compared with others. Our findings demonstrate that patient counseling plays an important role in improving the QOL by changing their psychological thinking and bringing them toward spirituality. To determine the long-term outcome of nephrotic syndrome (NS) in children, we studied 48 patients with the NS aged seven months to 12 years at onset and followed for a long period (3-9 years). Consanguinity was positive in 31.2%. Patients' history of atopy was present in 25%, while family history of allergy was present in 18 (37.5%) patients. Renal impairment at initial presentation was observed in 12.5% of the patients. Among 32 biopsied patients, 11 (34.3%) had focal segmental glomerulosclerosis and eight (25%) revealed mesangial IgM nephropathy. Outcome at two years of presentation showed 41.6% patients as frequent relapsers, 39.5% as steroid dependent and18.7% as steroid resistant. Forty-three patients were available for follow-up after ten years of presentation, 22 (51%) patients had complete remission, 15 (34.8%) were steroid dependent, two (4.6%) developed chronic renal failure and two (4.6%) died. Two patients (4.6%) developed insulin-dependent diabetes mellitus, two (4.6%) had cataract and one (2.3%) had documented peritonitis. In conclusion, the high incidence of steroid-dependent, frequent relapses and steroid resistance in children can be explained by different factors, including consanguinity, atopy and severe presentation at onset of disease. We suggest longer initial treatment at onset for this group of patients. The low incidence of infection in this group needs to be addressed in future studies. The aim of our study was to assess the role of rituximab (Mabthera) in the treatment of patients with corticosteroid-resistant and calcineurin-inhibitors ± cellcept refractory idiopathic nephrotic syndrome (INS). A total of 83 patients who had required the previous treatment for a minimum of two years were included in the study. Our protocol included the use of rituximab in four-weekly slow infusions. Five patients were excluded as they could not tolerate rituximab infusion for allergic reaction. As expected, none of the patients had a decline in the total circulating lymphocyte counts yet all had achieved decline of their initially normal CD20 to < 0.5% one month after infusion. The decline persisted for eight to ten months later. In the minimal change disease (MCD) group, 31 of the 32 patients had complete remission (CR) and were off any immunosuppressive therapy and one of the previous non-responders (NR) did not respond. Excluding two patients who had required retreatment, the others remained in CR (17 up to 28 months and six up to 36 months). Treatment with rituximab resulted in amelioration of NS in 17 of the 18 patients with focal segmental glomerulosclerosis (FSGS), while only one patient remained NR. Although renal function remained stable, proteinuria reappeared by eight to 12 months. Retreatment with rituximab resulted in a similar response with stable kidney function. In the 28 patients with membranous glomerulopathy (MG), 24 had achieved CR. Two patients failed to respond and two had partial remission. By 12 months, all patients relapsed. The response was within one month following treatment in patient with MCD, but was gradual within three months in FSGS and MG. Relapsers in all groups responded in a similar pattern to repeat dosing with the drug subsequently. Our prospective study represents an adequate number of patients with biopsy-proven subgroups of INS in both children and adults with long-term follow-up of treatment with rituximab. The drug is effective and safe for treatment of patients refractory to the conventional agents. The clinical manifestations of hyperuricosuria (HU) are usually underestimated by the clinician. The aim of this study was to review the clinical spectrum of symptomatology of HU and to evaluate the presence of associated hypercalciuria (HC) and hyperoxaluria (HX). A retrospective review was done on 64 children with HU seen between January 2004 and December 2008. The patients were divided into HU 19, HU + HC 4, HU + HX 21 and HU + HC + HX 20. The mean age at diagnosis was 80 months (range six to 156 months). Duration of follow-up ranged was from six to 66 months. There were 228 symptomatic episodes for 64 patients (males 31, females 33). The relationship of symptomatology to age and gender were not significant. The most common symptoms were abdominal pain 67.2% (in 7/44 it was localized to the right lower quadrant, mimicking appendicitis), flank pain 59.4%, increased urinary frequency 43.4%, urgency 39%, enuresis 31.25%, oliguria 29.7%, dysuria 25%, red urine 20.35%, vaginal itching 15.21%, dribbling 14.06%, orange urine 12.5%, hesitancy 12.5% and penile pain 7.81%. To our knowledge, the vaginal itching and penile pain were not previously described. Family history was positive for stones and/or gout in 62.5%. The presence of a positive family history and red urine were significant (P-value <0.05) for the presence of an underlying HU. In the presence of recurrent abdominal/flank pain, hematuria without proteinuria or edema and urological symptomatology, especially in the presence of red urine, and a positive family history of gout or stones, a search for HU is in order. This will avoid unnecessary and invasive investigations. Constant increase in the incidence of type-1 diabetes (T1-DM) has made it necessary to have new markers for the early detection of diabetic nephropathy (DN). One of the markers that could be helpful in detecting functional alterations in renal hemodynamics is assessment of the renal resistive index (RI) by using renal Doppler. We studied 25 patients with T1-DM (Group-A), which comprised of 15 females and 10 males, with a mean age of 10.8 ± 2.2 years and duration of diabetes of 5 ± 1.1 years. A control group (Group-B) comprising 20 healthy children, 12 females and eight males with mean age of 11.6 ± 2 years, was also studied. The following parameters were studied in the two groups: age, serum creatinine, albumin excretion rate (AER), glomerular filtration rate (GFR), glycosylated hemoglobin (HbA1c) and mean renal RI of both kidneys. 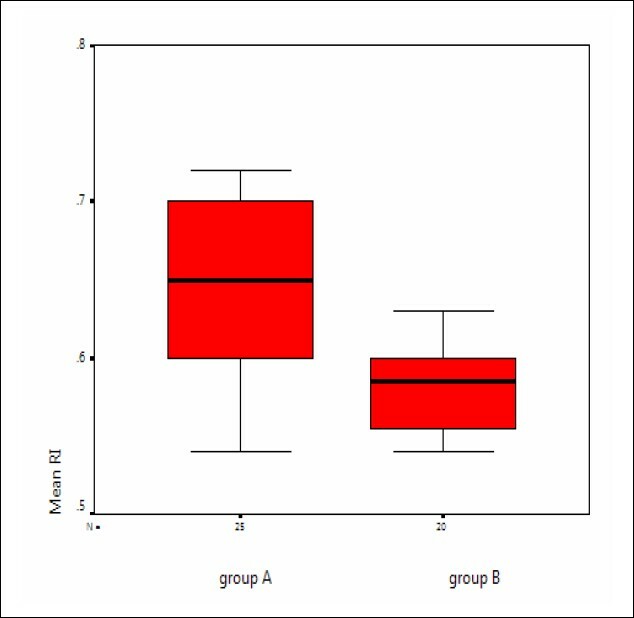 We found an increase in the mean RI in diabetic patients versus healthy children; the mean RI in Group-A was 0.64 ± 0.55 while it was 0.58 ± 0.0.28 in Group-B (P <0.000). This increase in RI had a positive correlation with duration of the disease, GFR and HbA1c levels, but there was no correlation with serum creatinine or AER. We conclude that RI is increased early in TI-DM, and it can be a predictor of DN. A little is known about the behavior of the renin-angiotensin system (RAS) in glomerulo-nephritis (GN), although it is activated in other models of injury. To study renal angiotensin-converting enzyme (ACE) messenger ribonucleic acid (mRNA) gene expression in patients with GN to determine its role in the disease process and other factors that may influence the course of the disease and the prognosis, e.g. treatment with ACE inhibitor (ACEI) drugs, we studied 20 patients with GN allocated to two groups: ten patients received an ACEI drug and ten patients did not receive ACEI in addition to a control group of ten healthy subjects. Routine and special laboratory investigation, histopathological studies and quantitative polymerase chain reaction analysis for renal ACE mRNA were done for both the study and the control groups. There was a statistically significant increase in ACE mRNA gene expression in the GN groups than in control group, but no statistically significant difference in ACE mRNA gene expression between the patients group that received and the group that did not receive ACEI. A significant correlation was found between the ACE mRNA gene expression and the mean blood pressure, serum creatinine, blood urea nitrogen and 24-h urinary protein. In conclusion, a higher level of ACE mRNA gene expression in patients suffering from GN may suggest a role of the RAS in the process of GN, perhaps contributing to glomerular hypertrophy and matrix overproduction. The use of ACEI drugs possibly slows the rate of progression of renal failure and plays a role in controlling the pathophysiology. Primary focal segmental glomerulosclerosis (FSGS) has recently been divided into five subtypes by the Columbia classification. 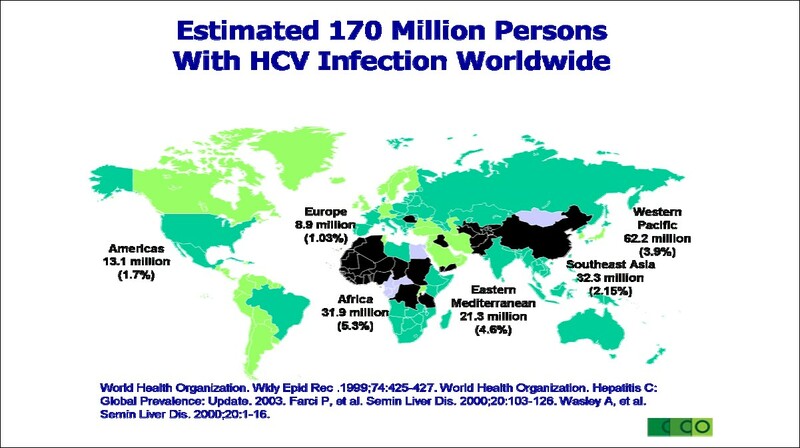 However, little is known about the incidence of these subtypes in the Indian population. In addition, there are very few studies evaluating the clinico-pathologic features with morphometric parameters in these subtypes. 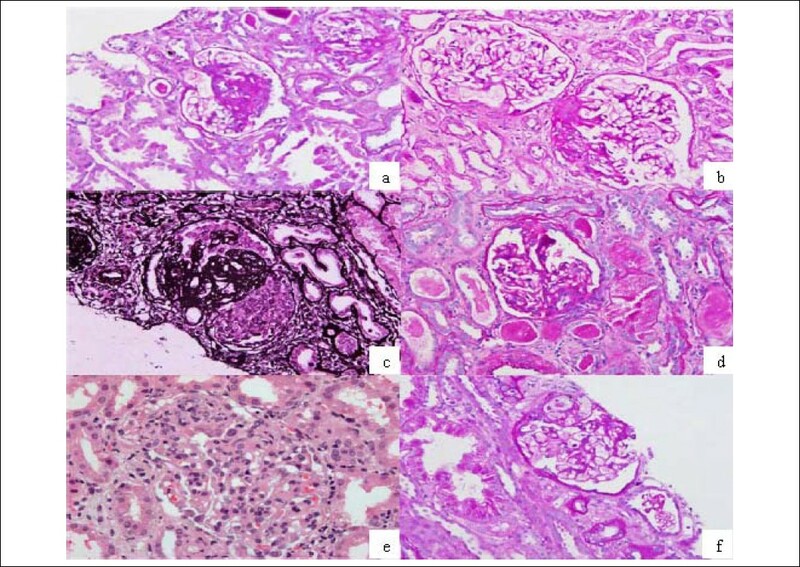 This study was aimed at evaluating the clinical, histopathological and morphometric parameters in various subtypes of FSGS at our referral center. Sixty-five (65) cases of idiopathic FSGS, diagnosed over two years (2006-2007), were included in the study. Detailed clinical and biochemical investigations were noted. Histological sections were reviewed and cases classified according to the Columbia classification and various glomerular and tubulo-interstitial features were noted. Glomerular morphometry on digitized images was performed using image analysis software. Renal biopsies with minimal change disease were used as controls for morphometric evaluation. In this study, FSGS not otherwise specified (NOS) was the most common subtype (44.6%), followed by perihilar FSGS (24.6%), collapsing (13.8%), tip (12.3%) and cellular FSGS (4.6%). Collapsing subtype showed significantly shorter duration of symptoms and higher degree of proteinuria, mean serum urea and creatinine compared with the other subtypes. On histologic analysis, features like glomerular hyalinosis, capsular adhesion, mesangial proliferation and visceral epithelial cell prominence (VEP) were frequently seen. The cases with VEP had a shorter duration of symptoms and a higher mean serum creatinine and 24-h urine protein excretion compared with those without VEP. The morphometric study revealed a significant higher mean glomerular area in the NOS, perihilar and collapsing variants as compared with the control biopsies. The present study highlights the differences in the prevalence in the FSGS subtypes in our population compared with the western data. Also, the significant differences in the clinical, biochemical and histological parameters reaffirm the utility of the Columbia classification of FSGS in routine reporting of renal biopsies. We found VEP (without causing collapse of the tuft) to be associated with higher serum creatinine at presentation. This feature needs to be evaluated in further studies for its potential significance. A 44-year-old Pakistani lady with end-stage renal disease secondary to rapidly proliferative glomerulonephritis underwent successful renal transplantation. Three years later, she was referred to the surgeon with an abscess in the axillary region at the site of a previous arterio-venous (AV) graft. She underwent repeated incision and drainage of the abscess, which was constantly recurring. Nine months later, she presented with a tender swelling at the site of the AV graft with purulent discharge. The graft was removed; culture and histology confirmed the presence of tuberculosis (TB). 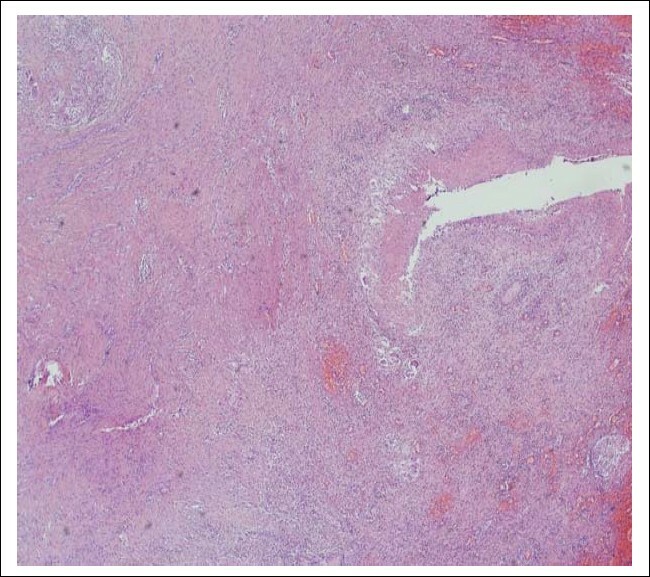 This patient presents a rare case of TB infection in the AV graft. The hemolytic uremic syndrome (HUS), characterized by microangiopathic hemolytic anemia, thrombocytopenia and acute renal failure, represents one of the major causes of acute renal failure in infancy and childhood. The typical form occurring after an episode of diarrhea caused by Escherichia coli is the most frequent in children. Other microorganisms also may be responsible for HUS, such as Streptococcus pneumoniae, which causes more severe forms of the disease. 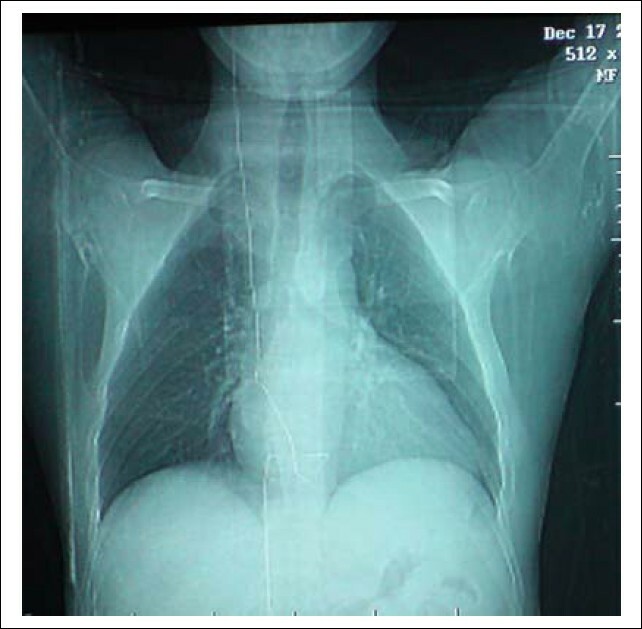 We report an 8-month-old girl who presented with pneumonia and subsequently developed HUS. 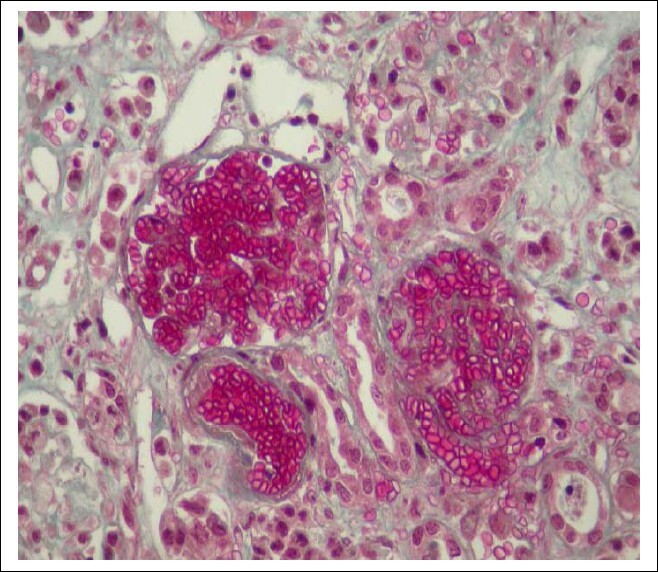 Renal biopsy showed characteristic lesion of thrombotic microangiopathy and extensive cortical necrosis. She was managed with peritoneal dialysis but did not improve and developed severe sepsis due to staphylococcal peritonitis, resulting in the death of the patient. Streptococcus pneumoniae-induced HUS is uncommon, but results in severe disease in the young. There is a high risk of these patients developing end-stage kidney disease in the long term. 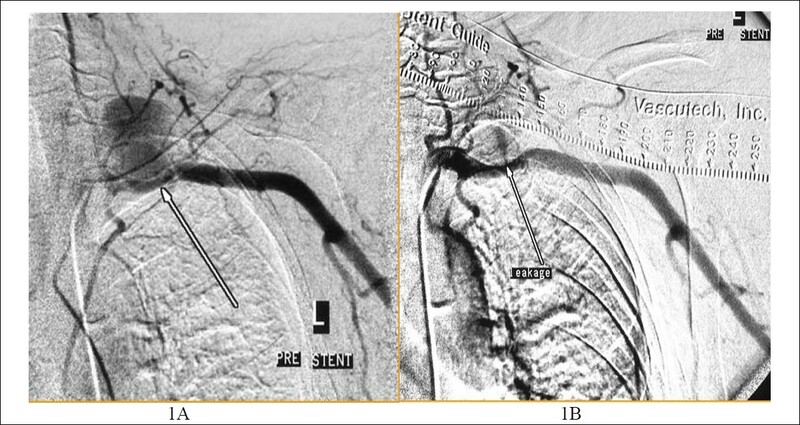 In the present report, we describe the case of a 76-year-old hemodialysis patient who was admitted with clinical features of neurological thoracic exit syndrome due to subclavian artery pseudoaneurism following the insertion of a dual lumen vascular internal jugular catheter (vascath) with excellent outcome after endo-arterial stent placement. Perivascular epithelioid cell tumors are a family of related mesenchymal neo­plasms that include angiomyolipoma, lymphangiomyomatosis, clear cell sugar tumor of the lung and a group of rare morphologically and immunophenotypically similar lesions that show immunoreactivity for both melanocytic (HMB-45 and/or melan-A) and smooth muscle (actin and/or desmin) markers. 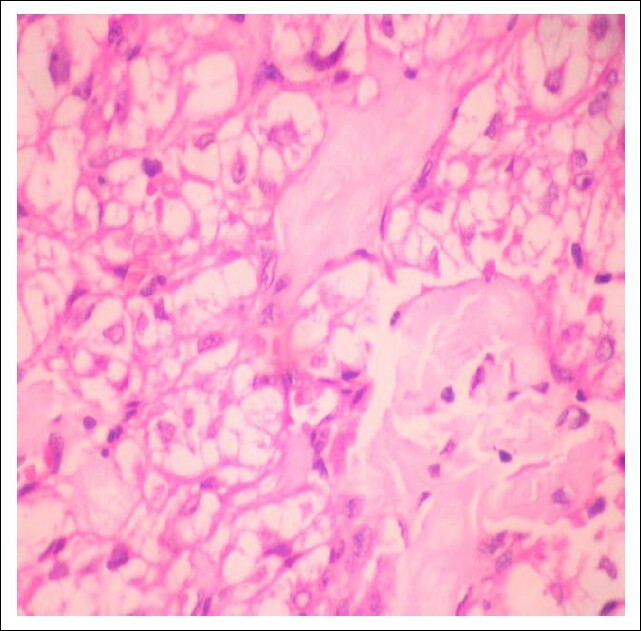 This case is presented for its rare occurrence and characteristic mor­phologic and immunohistochemical features. Renal tubular acidosis (RTA) is not uncommon in HIV-infected children with ad­vanced disease, and has been described mainly due to nephrotoxic anti-retroviral therapy and in association with prophylaxis or treatment of Pneumocystis carinii pneumonia with co-trimoxazole. 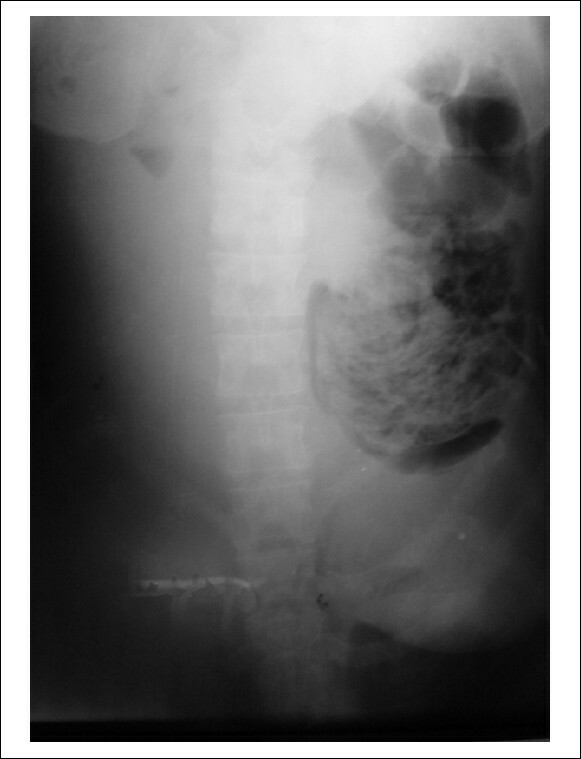 We describe an 8-year-old boy, newly diagnosed to have HIV infection, who presented with distal RTA. There were no features of chronic RTA in the form of rickets or nephrocalcinosis, making an inherited form unlikely. Hereditary hypomagnesemia with secondary hypocalcemia (HSH) is a rare condi­tion caused by mutations in the Transient Receptor Potential Melastatin 6 (TRMP6) gene. Patients usually present during early infancy with symptomatic hypocalcemia; however, intracranial calcification has not been previously reported in HSH. We report on a three-month-old Saudi girl who presented with hypocalcemic convulsions and was initially treated as nutritional rickets. However, further biochemical analysis of blood and urine were suggestive of HSH. This diagnosis was confirmed by mutation analysis, which identified a novel homozygous frame shift mutation (ins 2999T) of the TRMP6 gene. A computed tomography brain scan, done around the time of diagnosis, identified bilateral basal ganglia calcification (BGC). Her serum calcium and the BGC improved with magnesium replacement. BGC can be added as a new feature of HSH and the case highlights the importance of measuring serum Mg in patients with hypocalcemic convulsions, particularly in children of consanguineous parents. A poor, uneducated patient from a rural background presented to us with burning micturition and colicky pain in the loin. He had undergone surgery for pelvi-ureteric junction (PUJ) obstruction on the right side four years earlier. Following surgery, the patient was irregular in his follow-up and, as such, he did not get the double "J" (DJ) stent, which was placed during surgery, removed. Ultrasonography performed during the present admission revealed mild hydronephrosis of the right kidney with a tiny calculus in the urinary bladder. 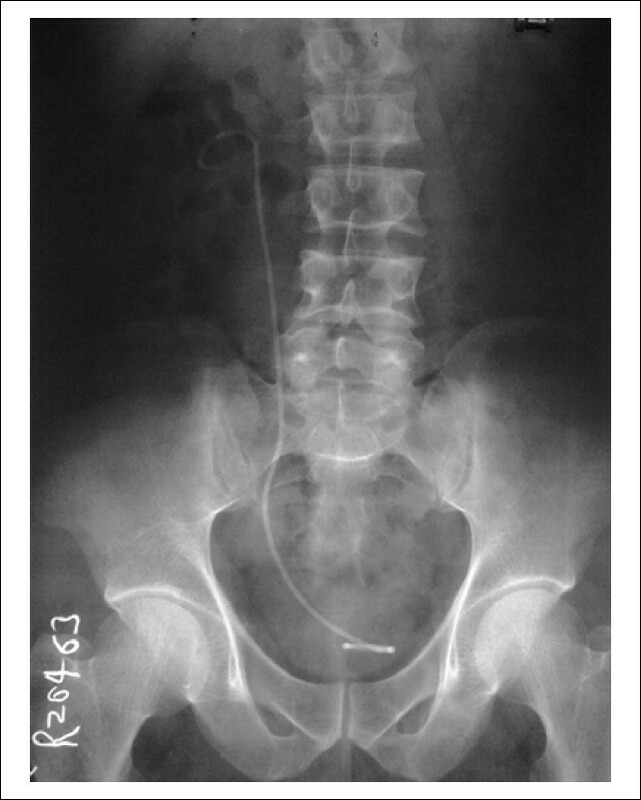 Intravenous urography revealed mild hydronephrosis with the DJ stent in situ in the right kidney. After an unsuccessful attempt with cystoscopy, the stent was removed successfully by suprapubic cystostomy. The post­operative course was uneventful and the patient was discharged in seven days. Emphysematous pyelonephritis (EPN) is a rapidly progressive and life-threatening infection that is seen most commonly in persons with diabetes. The infecting organisms usually consist of mixed flora, including Escherichia coli (68%), Klebsiella pneumoniae (9%) and Proteus mirabilis. Females are affected twice as often as men, and mortality rates can be as high as 80%. Obstructive uropathy, urinary calculi, calyceal stenosis and neoplasms are significant predis­posing factors. We report a case of EPN in a patient with the human immunodeficiency virus infection, without diabetes mellitus or urinary tract obstruction, which responded remarkably to conservative management with antibiotics alone. Feedback is an essential element in the process of students' learning and develop­ment. This study aimed to explore the views of medical students regarding the importance and process of feedback in their medical education. A cross-sectional questionnaire-based study was conducted in our college of medicine. The questionnaire included questions to assess the students' views about the importance and the need of feedback in the learning process and whether feed­back should follow certain or all forms of assessment. In addition, the questionnaire contained questions that aimed to explore students' views about the contents and process of feedback. One hundred and eighty-six male medical students participated in this study. While the majority of students (85%) indicated that feedback was important for their learning and expressed their need for regular feedback during their study, only about 20% of them indicated receiving regular feed­back. Senior students perceived that they received feedback less frequently than their junior colleagues' (P <0.05). The majority of the participants expressed their interest into receiving an immediate feedback after their summative and formative assessment. Students think that feedback should be balanced and include a suggested plan for their future learning process. Senior students showed a higher preference to have feedback that also contained points related to their strengths more than juniors. Students also indicated their preference to have one-to-one and written feed­back more than feedback that was conveyed in groups and verbally. These issues are of high im­portance and should be considered for planning and implementing an effective feedback system. Nephronophthisis (NPHP) is a recessive disorder of the kidney that is the leading genetic cause of end-stage renal failure in children. Egypt is a country with a high rate of consan­guineous marriages; yet, only a few studies have investigated the clinical and molecular charac­teristics of NPHP and related ciliopathies in the Egyptian population. We studied 20 children, from 17 independent families, fulfilling the clinical and the ultrasonographic criteria of NPHP. Analysis for a homozygous deletion of the NPHP1 gene was performed by polymerase chain reaction on the genomic DNA of all patients. Patients were best categorized as 75% juvenile NPHP, 5% infantile NPHP, and 20% Joubert syndrome-related disorders (JSRD). The mean age at diagnosis was 87.5 + 45.4 months, which was significantly late as compared with the age at onset of symptoms, 43.8 ± 29.7 months (P <0.01). 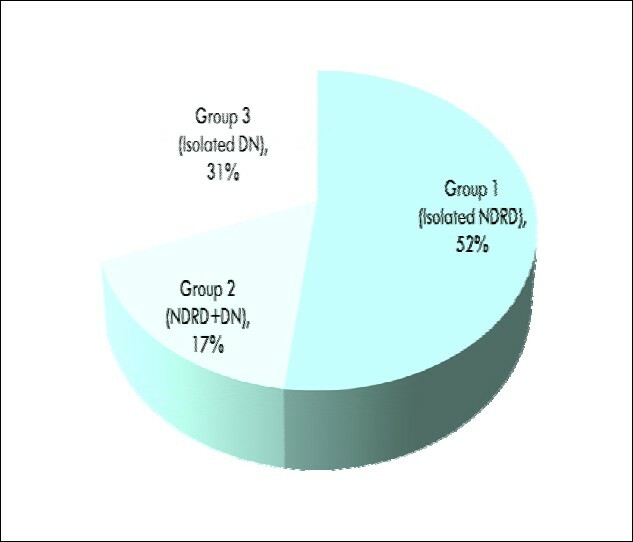 Homozygous NPHP1 deletions were detected in six patients from five of 17 (29.4%) studied families. Our study demonstrates the clinical phenotype of NPHP and related disorders in Egyptian children. 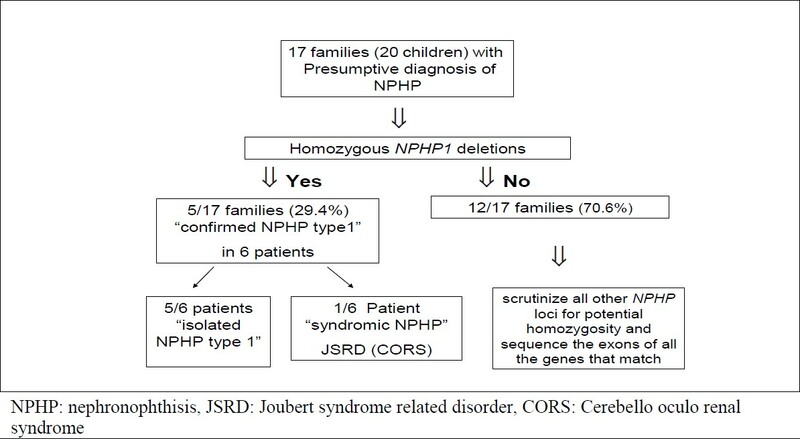 Also, we report that homozygous NPHP1 deletions account for 29.4% of NPHP in the studied families in this cohort, thereby confirming the diagnosis of type-1 NPHP. Moreover, our findings confirm that NPHP1 deletions can indeed be responsible for JSRD. Malaria is endemic all over Sudan. The population are at risk of malaria infection to variable degrees. 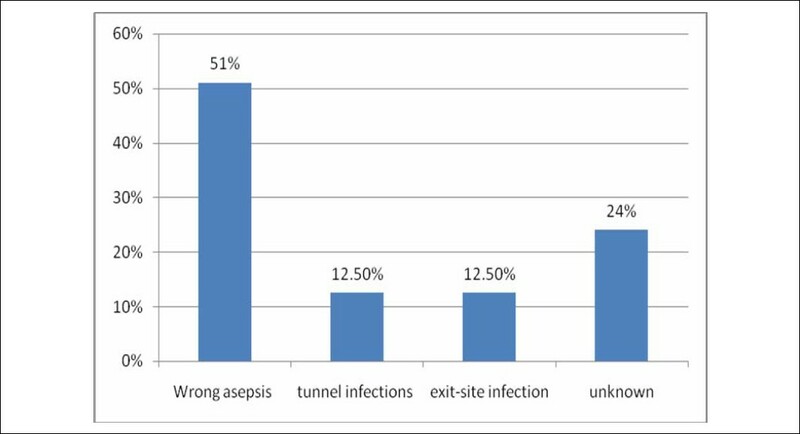 Kidney-transplanted patients on maintenance immunosuppressive therapy are known to be prone to infection, but there is not enough data in the medical literature as to whether they are more susceptible to malaria infection in endemic areas. This study was conducted in the Gezira Hospital for Renal Diseases and Surgery to assess the effect of maintenance immunosuppressive therapy in renal transplantation on malaria incidence. A total of 110 individuals were enrolled: 55 were renal-transplanted patients with end-stage renal disease who received kidney transplantation at least one year earlier and were on maintenance immunosuppressive medi­cations. The other 55 individuals were the compatible healthy group. Thorough follow-up was exercised for both groups for one year (January-December 2009). Following the World Health Organization criteria for malaria diagnosis, a total of 51 malarial attacks were reported in both the groups, 25 in the transplanted group and 26 in the controls. The incidence difference between both groups was statistically insignificant [0.76 (΁1.170) and 1.09 (΁1.917) P = 0.282 among transplanted group and control group, respectively]. Providing routine malaria prophylaxis is not required for renal transplant recipients on maintenance immunosuppressive. To determine the prevalence of post-kidney transplantation diabetes (PTDM) and to assess its risk factors, we retrospectively studied 92 non-diabetic kidney transplant patients. The immunosuppressive drugs used to prevent rejection included prednisone, a calcineurin inhibitor (cyclosporine or tacrolimus) and an antimetabolite (azathioprine or mycofenolate mofetil). Diabetes was defined according to the WHO criteria and the American Diabetes Association. The mean age of our patients was 35.8 ± 10.5 years, and there was a clear male predominance (56 men and 36 women). The graft was from living related donor in 71/92 (76%) patients. The prevalence of dia­betes in post-kidney transplant was 15.2%. The factors increasing the occurrence of PTDM included advanced age, high doses of steroids and cyclosporine. Management of PTDM included diet modification, oral anti-diabetic and insulin. We conclude that the prevalence of PTDM is significant in our transplant population and risk factors for its development are multiple and require aggressive multifaceted management. Diabetic nephropathy (DN) has become the most common cause of end-stage renal failure. Early referral and specific nephrology treatment could delay the disease progression and should reduce the treatment cost, mortality and morbidity rate in these patients. This is a single-center, retrospective review of all DN patients referred to the nephrology clinic in Hospital Sultan Ahmad Shah, Temerloh, from 2000 to 2009, to study and define the clinical characteristics of DN patients at the time of the referral to the nephrology clinic. A total of 75 patient case records were reviewed. Forty-three (57.3%) of them were males, with a median age of 64.3 ± 8.5 years at the time of referral. Only 14.7% of them had blood pressure lower than 125/75 mmHg. Co-morbid and disease-related complications were also commonly diagnosed and 28.4% (n = 21) had ischemic heart disease, 23% (n = 17) had diabetic retinopathy and 20.3% (n = 15) had diabetic neuropathy. The mean serum creatinine at the time of referral was 339.8 ± 2.3 μmol/L, gylcated hemoglobin A 1c (HbA1C) was 8.1 ± 2.0 %, serum fasting glucose was 9.6 ± 4.7 mmol/L, serum cholesterol was 5.4 ± 1.2 mmol/L and hemoglobin level was 10.6 ± 2.9 g/dL. Although female patients were less frequently seen in the early stages of chronic kidney disease (CKD), they comprised at least 72.7% of CKD stage 5 (male:female; 6:16, P <0.05). Twenty-nine percent (n=22) of them were referred at CKD stage 5, 48% (n=36) were at CKD stage 4, 17.3% (n=13) were at CKD stage 3, 4% (n=3) were at CKD stage 2 and 1.3% (n=1) was at CKD stage 1. Advanced CKD patients were frequently prescribed with more antihypertensives. CKD stage 5 patients were prescribed with two-and-half types of antihypertensive as compared to two types of anti-hypertensive in CKD stage 2 and stage 3. Furthermore, ACE-inhibitors (ACE-I) were less frequently prescribed to them. Only 22.7% (n=5) of CKD stage 5 patients received ACE-I and 30% (n=11) in CKD stage 4 patients as compared to 53.4% (n=7) in CKD patients stage 3. This review shows that DN patients were referred late to the nephrologists and the overall disease management was suboptimal. Antihypertensive requirement was also increased and ACEIs were less frequently pres­cribed in the advanced diabetic nephropathy patients.